What each has in common other than making spirits is welcoming visitors to their distilleries and tasting rooms. Only Guild members can be part of the Whiskey Trail, and Tennessee has more distilleries that are not members. 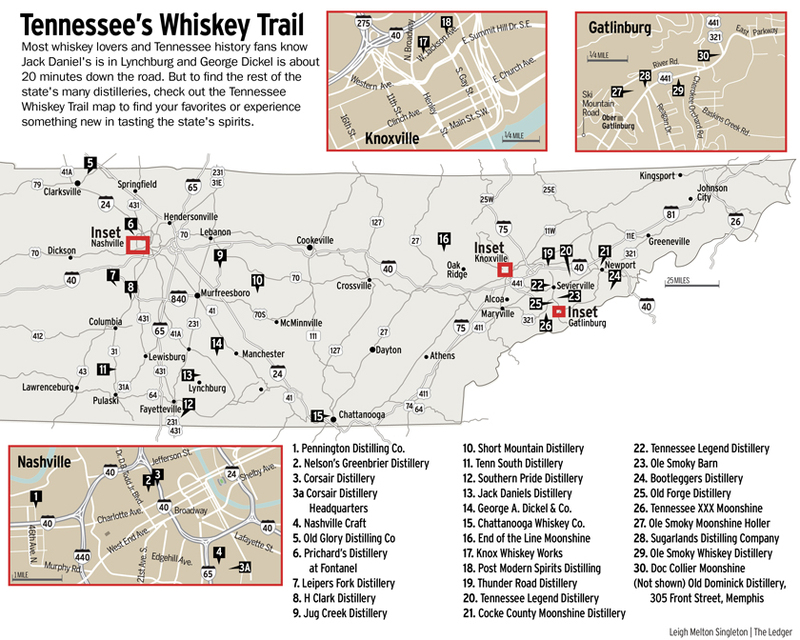 The Guild launched the Whiskey Trail in 2017, and there are maps and brochures at www.tnwhiskeytrail.com, as well as at each stop. Samples are offered at most distilleries, though “tips” or minimal fees may be required to imbibe. Of course, no one younger than 21 can drink alcohol legally, but minors are permitted in most areas. There are 14 locations on the tour in Middle Tennessee, 11 in East Tennessee and one in Memphis. Visitors can secure a free passport book to collect stamps from every stop they visit. Folks who collect all 26 stamps receive a special gift to mark the achievement. Founded by childhood friends Darek Bell and Andrew Webber, Corsair focuses on producing a range of products including whiskeys, gins, absinthe, rum, vodka and brandy. Corsair’s spirits feature the use of smoked barleys, alternative grains and unusual brewing techniques not typically found in the distilling community. Tours daily, except Mondays. Born 40 years after the signing of the Declaration of Independence, George A. Dickel was an established Nashville merchant when he entered the whiskey business. For nearly 150 years, the distillery has been faithful to the recipe Dickel created and perfected and is still made just as it was in 1878. Tours daily ($10). Charles Nelson was producing and selling nearly two million bottles of whiskey annually in 1885, making him the largest producer of Tennessee Whiskey in the world before prohibition. Descendants, brothers Andy and Charlie Nelson, have relaunched the historic Tennessee business in Nashville’s Marathon Village, welcoming the public into their modern-industrial distillery space. Tours daily. When this craft distillery in Thompson’s Station opened in 2014, it became the first legal distillery in Williamson County in more than 100 years. H Clark crafts its spirits 100 gallons at a time in the same building local farmers have used to house grains before loading them on the railroad for sale generations ago. The granddaddy of Tennessee Whiskey, the distillery opened in 1866. By 1904, its Old No. 7 whiskey its signature seller to this day took the first of several gold medals at the World’s Fair in St. Louis. Tours daily. This artisanal distillery with fruit infused liqueurs, gin, vodka and whiskeys is the first legal distillery in Wilson County since prohibition. Nestled on 54 scenic acres, it serves as an event site as well. Tours daily, except Monday. Since opening in 2016, proprietor Lee Kennedy has pledged “to pour our heart and soul into every drop of whiskey we make from grain to glass.” The distillery boasts a music hall and event space. Tours daily, except Monday. Opened in May 2016 with a focus on creating real craft spirits from scratch, owner Bruce Boeko uses local and regional ingredients and resources whenever possible. Popular small-batch products include Naked Biscuit Sorghum Spirit (its first product) and the topically named Crane City Gin. Tours daily, except Monday. Old Glory is a small batch artisan distillery in Clarksville. New to the scene, Old Glory’s prized Tennessee Whiskey and Bourbon are a few years from release since oak barrels “only ask for time to work their magic.” To minimize the wait, the distillery has crafted small-batch Tennessee Whiskey in half-size barrels. Tours daily. Located on a 400-acre working farm in Cannon County, the facility consists of a production house and restaurant where the tasting room and bottle shop are located. Tours Thursday-Sunday. This is a small-batch grain-to-bottle operation in Southern Lincoln County. Nestled on a beautiful farm, it’s run by an owner and distiller who spent 25 years working with the Jack Daniel Distillery. Tours daily, except Sunday. Established in 2011, Pennington is an urban, industrial distillery responsible for creating some of the largest volume craft brands in the area, including Whisper Creek Tennessee Sipping Cream and Pickers Vodka. This summer the distillery tapped its first barrel of aged whiskey. Tours Thursday-Saturday. Prichard’s hand crafts American distilled spirits in small batches using copper pots and charred white oak barrels “to allow for the best possible flavor.” The original distillery in Kelso is in an old schoolhouse where the basketball hoops still hang on the wall. The second distillery (Prichard’s Distillery at Fontanel) sits on the Fontanel Mansion grounds on Whites Creek Pike in Nashville. Since opening its doors in 2012, Tenn South states it respects tradition, heritage and history “in what we do and how we do it.” Its Moonshine, “Black Mule” Vodka, “Abernathy” Gin and “Clayton James” have all been awarded medals in national spirit competitions. Tours daily, except Sunday. Believed to be the smallest batch distillery in the nation, Bootleggers brews its ‘moonshine’ in 25-gallon pot stills, a method followed for more than 100 years. Tours offered daily. This is the first legal distillery in Chattanooga in more than 100 years. Tours at Chattanooga Whiskey, offered daily at $12 a person, include a look into Chattanooga’s rich distilling history prior to Prohibition, and how the company helped change century-old laws. Doc’s Shine Shop is setup just like an old-fashioned Mercantile Store, where his daddy first sold ‘shine.’ The Moonshine Brandy is a signature spirit. Tours offered daily. End of the Line boasts its true Tennessee Moonshine in honor of Brushy Mountain State Penitentiary. Rather than hardened character, the ‘shine’ comes in flavors such as apple pie, blackberry, fruit punch and butterscotch. Established in 2015 as Knoxville’s first (legal) distillery, using locally-grown heirloom corn. The award-winning Old City Heirloom Corn Whiskey is a favorite. Tours daily, based on availability. In 2014, Old Forge opened its doors with its own line of moonshine. Inside the distillery, in copper column stills, Head Distiller Keener Shanton crafts small-batch spirits including 1830 Original, a moonshine made from pure mountain spring water and fresh-ground grains. Tours and tastings available on request. In July 2010, Ole Smoky opened in Gatlinburg, becoming Tennessee’s first legal moonshine distillery as well as the most visited distillery in the world with over 2.5 million visitors annually. Now with three locations. Tours daily. Opened in August 2017 in Knoxville’s Old City District and began producing vodka, gins, and liqueurs. Currently barreling American single-malt whiskey. Tours daily. In addition to free daily tours, the distiller offers premium, private experiences to visitors who want to survey the intricate details of the distillery. With it comes the opportunity to taste the final product — award-winning Sugarlands Shine. Sugarlands has constructed three octagon bars (Sippin’ Posts) for folks to gather around and sample products. With two locations in Sevierville, Legend serves up several variations on moonshine, along with vodka, whiskey and cream liqueurs. Tours daily. Named for the roads that moonshiners used for running, and the famous movie starring Robert Mitchum that told their tale, Thunder Road, its website states, celebrates American individualism and freedom. Tours daily. In 1866, Domenico Canale originated Old Dominick Whiskey in Memphis. Five generations later it returned in Spring 2017. A revival of Domenico’s pre-prohibition Southern-infused whiskey is a highlight. Tours every day but Tuesday.